Jan 2nd, 2014 was our first LW Coaching Facebook open MTB coaching day for 2014. Lots of racers liked our page and joined in the chat, eager to get 2014 training plans in place and questions answered. Questions came fast and it was fun keeping up with everyone’s racing stoke – love that. Don’t take my word for it though! Look below and read through the compilation of mountain bike training questions and answers from our January day. Thank-you to everyone who participated. It’s rewarding as a coach to have so many athletes spend the time to post and trust me with training questions. It was a great day. Mark your calendars. 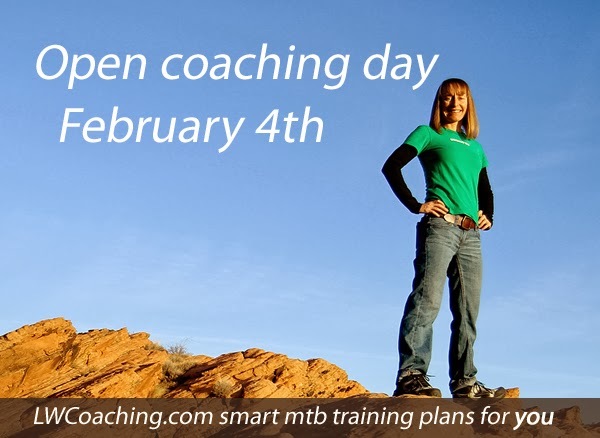 Our next Facebook Open coaching day is February 4th and you are invited. Chris P: Sleep deprivation has always been a weakness for me and rarely have I pulled off an all-night ride without a nap. I’ve tried caffeine up to 200mg, music, riding solo and in a group, and even smacking myself around a little to no avail. My legs feel great and power is good but my eyes just can’t stay open. Is it a trainable skill? How can I keep rolling until dawn? Coach Lynda: Chris, I don’t believe this is a trainable skill. Taking too much caffeine can put you to sleep too. One cup of Joe wakes me up and three cups makes me sleepy. Too much caffeine will interfere with your GI and slow down your fueling ability also. Sleep experts I have consulted with say every individual has a “sleep personality” that is probably genetically programmed. The best strategy is to learn to optimize your own sleep personality. Some people are block sleepers and rarely take naps and others are great nappers. On an average day do you take naps? DH can lie down anywhere, anytime and pop off a 10 min nap. Makes me jealous cause I cannot nap. On the other hand, I have no problem staying awake for 36 hours in a solid block then sleeping for 13 hours in another solid block. Your fastest and safest strategy might be micro naps. Coach Lynda: Gretchen, sounds like you just need to ride lots at this point! Ride with different people, ride different types of bikes on a variety of terrain and seek out all kinds of skills clinics. Most of all, have fun on your bike to stay engaged and keep progressing. Jean P: I’ve gotten almost a week behind on a training plan and was wondering whether I can jump ahead to get the days back on track with my schedule… especially since I’m feeling good. Or do I gradually morph the workouts to catch up? Coach Lynda: Jean, I recommend dropping all the missed workouts and getting back on your scheduled plan today. Start fresh where you would have been if you had stayed on target. Lisa R: I’m starting the Masters 40+ MTB Cross Country Base Training Plan and was wondering if I should skip the early season races as they are clearly going to be way higher intensity than the prescribed workout. Will doing those events hurt in the long run? Coach Lynda: Lisa, do you want to do these early season races? What is your motivation level? Lisa R: Lynda- I’m indifferent about the early season events other than the Feb. Snake Creek Gap. My first real race is early April. I want to do what is smartest for me in the long run. Coach Lynda: Lisa, I recommend racing the events you really want to do and avoiding the ones you are indifferent about. Add a little extra rest before Snake Creek Gap and proper recovery after. Don’t make up any missed sessions. Stick to the plan the rest of the time. Lisa R: Lynda- Also, I am a bit sore in the calf and hamstring areas from the new strength routine. I think I stayed light, but they were new to me exercises. Train through the soreness or no? Coach Lynda: Lisa, It is ok to train through light muscle soreness. It is not ok to train through intense muscle pain, joint pain, tendon or ligament soreness. Coach Lynda: Pete. I do not have a Masters 24 hour solo training plan yet but it is in the design queue. To “masterize” the current 24 hour plan I recommend (1) Continue the strength maintenance program from the Masters 40+ Build, Peak and Race training plan. (2) Drop weeks 3 and 7 from the plan to create a 2 weeks on 1 week off training cycle. (3) Shorten the ride week 10 day 7 from 6 hours to 3 hours to create a slightly longer taper. Pete H: Thanks Lynda. Will let you know how it all pans out in July! Kevin C: As I get older recovery seems more important than ever. Are there guidelines for recovery as we age, or is “listen to your body” the best method. Coach Lynda: Kevin, great question. We definitely recover more slowly at 40 than we did at 20. The Masters 40+ crowd benefits greatly from putting extra work into recovery techniques. Read this doc: Tools to Speed Recovery to add some tricks to your repertoire. Listening to your body is key at any age. The penalty for not doing so is higher as we age. Carrie K: Going for a 6 hour solo mtbk. I have five years of race experience, but in a very casual way. I’m in it to stay healthy and have something to look forward to. This is my first year racing while working full time, raising three kids and managing chronic illness, which definitely interferes with energy and riding at times. I am using your winter maintenance plan currently and plan to start your 6 hour solo plan after that. Last year I did a 12 hour two person and hadn’t done any specific training. This year I want to be prepared so that I can actually enjoy the experience. Coach Lynda: Carrie, racing to stay healthy and have something to look forward to are valuable goals. Coach Lynda: La Kelly, what did you have fixed on your knee? Have you been doing PT? Is your knee fully healed? Coach Lynda: La Kelly, Ouch… First off do everything your Dr and PT tell you to do. Their advice and safety take precedence. No more damage is a prime goal. Start building your power with a low volume of 30 sec intervals done as 30 sec power L5 (VO2max pace) alternated with 30 sec recovery. Start with 4 on 4 off and work up to a set of 10. Provided that feels good, progress to two sets of 10 with 5 mins recovery between. I recommend limiting these sessions to twice per week and spend the rest of the time working on your aerobic endurance, tempo sessions and a low volume of threshold work to round out your comeback. La Kelly: Ahhhh, thank you Lynda!! It’ll be good to have some focus. Happy new year! Mark T: First, thanks so much for providing this service. You are awesome. So…I race 4 – 24 hour races primarily. The first race is in March, an 8 hour race. It’s off season but how much speed work should I be doing and of what length? Coach Lynda: Mark T, What is your goal for the 8 hour race? When are your 24 hour races? Which is your highest priority? Mark T: 8 hour race – Top 5 masters (I’m 52). This race is 95% singletrack with loads of climbing. I have one 18 hr in Sept (that I won last year – masters), 100 milers in July and August and a bunch of 40 – 50 milers throughout the year. I haven’t locked down additional 24 hour races yet. 400 miler in October. The 8 hour race is not really a priority. If I were to say my top priorities it would be the 100 miler in July and the 18 hour in Sept. I race for a team though so I need to maintain fitness throughout the season. Thanks! Coach Lynda: Mark, To peak for a July 100 miler in July the type of intervals I recommend at this point in your season are skills work, long steady power L2 aerobic pedaling sessions and shorter duration threshold work such as 6 x 6 min at power L4. This is a prime time of year to increase your technical ride skills if you have access to dry dirt. An example of a two week training schedule that fits your training period right now is here Masters Base training plan 2 week preview. Mark T : Thanks…is that the program you recommend or should I be looking at the Masters 40+ 100 miler…or a combination? Thanks! Coach Lynda: Mark T, the Masters 40+ MTB Cross Country Base Training Plan followed up with the Masters 40+ MTB 100 Mile Personal Record Training Plan is the training plan stack I recommend for you. Mark T: Cool! Thanks again. Bobby B: I am trying to set goals for this season. How do you set a goal for a race you have never done? I am doing the whiskey 50 and have no idea how to set a goal for that race? Coach Lynda: For a race you have never done before, I recommend you set execution goals rather than performance or outcome goals. Goals can be to execute a specific race strategy or pace at a certain HR up the entire Skull climb, have perfect fueling, sprint to the finish line etc. What will make you proud of yourself and fulfilled when you cross the finish line other than a time or placement? Sharon M: Why is it ill advised to train outside the base training? I understand that you are to stay away from high intensity but I am not certain as to why you avoid this during base…. Coach Lynda: I do not support avoiding intensity during Base training. It is ill advised to avoid intensity for months on end. Who advised you to do this stay away from intensity? Not me. I do not support months of long slow miles, especially for women. Long slow miles and nothing else leaches bone density in women – bad news. Plus it makes you slow. Jean P: Do you have some reading to recommend on long slow miles leaching bone density? My cycling sister and I both have low bone density. I run too which I think of as part of my weight bearing exercise, but only recently added intensity workouts. Coach Lynda: Cycling and bone health: a systematic review. John Beaupre: Thank you Lynda for open coach forum. I am a Cat 1 Masters racer running in the New England region. Last year was my 1st full season racing MTB’s and I learned a lot about my strengths and weaknesses. Climbing/descending and tech skills are my strengths (ex MX racer), power sections are my biggest weakness. I ride on avg 5-6 hrs a week, split between geared and SS (up to 8 hrs occasionally). In the summer I add some road rides. I do not use any specific training programs but I do tempos, intervals and recovery rides and have a good handle on nutrition, rest and core/strength exercises (pliates and elastic band work). I was a consistent top 3 finisher including several top 5 overalls in the cat 1 class. What would you suggest to help improve my power? Any good resources for off bike strength training too? Thanks again. Coach Lynda: John Beaupre, To improve your flat power riding work on VO2max and accelerations. Athletes Performance is a great strength training resource. Maaike E: I’m signed up for Breck Epic and that will be my first stage race. Most training plans are geared towards getting in shape for a 1 day race. Any specific advice how to adapt plans to take the increasing fatigue into account in a 6-day race? Thanks! Coach Lynda: Check out my suite of training plans designed specifically for stage racing Learning fast recovery techniques, long ride fueling and training back-to-back days are keys for stage race training. Beth S: Hi Lynda, I am looking for training suggestions based on my somewhat crazy work schedule. My goals this summer include a number of 12-24 hr ultra endurance races, all coed duo category but might try one solo. A few x country races, 1/2 growler, and the steamboat stinger in August. Last year I bought your 50 mile training plan for the steamboat stinger, but couldn’t make it work with my work schedule. I’m an ER nurse and work 6 12-hour shifts in a row and then have 8 days off (when I work 2 other jobs with variable hours). During my 6 days on I only have about an hour to exercise each day. I am limited to road biking (weather permitting), running, swimming, or heading to the gym. Any suggestions for me? I know that a personalized plan would probably be the way to go. Coach Lynda: Beth, Wow you are busy! I recommend following my TIME CRUNCHED training plans. These plans were designed to maximize the time a busy person *does* have. You know, kinda like – train smarter, not harder. Start with the TIME CRUNCHED Category 1 Cross Country Mountain Bike Base Training Plan then progress on to the TIME CRUNCHED Category 1 Cross Country MTB Build, Peak and Race Plan. Jim C: Hi Lynda, thanks so much for this great forum. I’m going to be doing your Masters XC base building plan and then adding your Masters 100 Mile MTB finisher plan. Hoping to enjoy my first 100 Mile MTB race Lutsen 99er) on 6/28. Problem is: I live in MPLS, where we’re stuck on trainers or spin classes until about the end of March. Question: How does spin class/trainer workouts map to your long endurance rides? I’m hoping to avoid 4 hour trainer workouts in my basement! Coach Lynda: Jim, I recommend doing the weekday shorter rides and interval sessions indoors on the trainer. For the skills sessions, be creative and find ways of improving your skills e.g. indoor bmx, indoor skills park, track stands in your garage, riding in the snow etc. Something on any bike that takes skill and balance. For the weekend longer endurance sessions I recommend doing something outside, aerobic and fun like xc skiing, snow biking, snow shoeing etc. I don’t recommend slogging out 4 hour rides on the trainer in the basement. You can combine activities to tally up endurance training time such as 45 mins on the trainer and 2 hours snowshoeing for a 2:45 session. Match the intensity guidelines for cross training sessions. Do your best to keep the long sessions enjoyable. That will keep you engaged, following through with the sessions and on track with the plan. Jim C: Great advice. So, my take away is, the priority is training volume at the right effort level, not necessarily on a bike. As long as the heart rate is in the right zone for the right amount of time, that’s the objective. I can work on skills in other ways. Coach Lynda: Exactly. The other priority is to have fun. Enjoyment keeps you engaged and on target. Kathryn B: Hi Lynda, I am hoping to finish a few 100 mi MTB races this season. The first is in May, second July , third August, and the last in September. I will follow your 100 Mile Mountain Bike Race – Personal Record Plan. In between races what should my training/recovery look like? Thanks for your help!! Coach Lynda: How many weeks do you have in between your races? Kathryn B: There are four weeks in between each race. Coach Lynda: With 4 weeks between each race I recommend 1. week off, 2. recovery week, 3. repeat week # 11 of the plan, 4. repeat week #12 of the plan. Bryan F: Happy New Year Lynda! Right now I have a couple events that are 3 and 4 months out that I’m training for. Sometimes I find that I have several months (up to 6) without anything to train for. What’s the best strategy to stay in pretty good shape? Ride lots? Follow one of the plans I have but do 1/3 to 1/2 of the intervals? Basically always be on a plan unless recovering the week after a race? I tend to find myself just floating around in these in-between periods. Maybe I need to do more racing so I always have a goal. Coach Lynda: Bryan, I don’t have a template of what to do between plans. That is a very personal thing based on your goals and lifestyle. All of the options you mentioned are good. Choose the one or the combo that sounds the most fun. What would you like most to do during that time? Bec B: Wow…I was thinking 3-4 weeks! I am trying to plan a race calendar and was thinking AZTR then 12 hours mesa verde a month later…but then another month add until the bailey Hundo…I hate recovery- summer isn’t long enough! Thanks for answering my question!! Coach Lynda: Racing these big events full bore is costly. You have to protect your long term health by being diligent with recovery. There is a dark side to going too long too much. Google FAMS for a reality check if needed. Bec B: Urgh! Thanks!! Reconsidering plans now as I sit on the trainer! Brian K: I have two questions, but I will make separate posts. When doing rides according to a training plan what do you recommend for going over the allotted time? Is there a percentage of ride time that you feel is still ok? Ex: Plan calls for 2 hours, but ride ends up being 2.5. I imagine a 1-hour ride shouldn’t turn into a 4-hour ride. Brian K: Race? I train with a light hydration pack that holds some repair gear, and other stuff. Most of my race times will be from 2+ hours to 6+ hours. When I look at pictures from races I plan on doing very few people have any sort of pack on. I get it, I can stuff pockets pretty full with all my stuff, but then I will probably have to stop at every aid station to top off bottles. I was thinking it would be better/faster to pack your own and skip aid stations, when you can. Thoughts? Coach Lynda: Brian, First priority is to drink and stay hydrated. On technical courses and crowded race starts it is tough enough to reach for a bottle that most racers end up dehydrated. If you believe you can stay hydrated, bottles are faster. The fastest strategy, bottles or pack or bottles plus small pack, is race specific. The ideal situation is to have a support crew hand you up full bottles. No extra weight and no stopped time. For a 2 hour race, unless it is a very hot day, bottles should get you through. For 6 hour races you need to weigh stopped time for each race. Stopping and filling up a bottle at an aid station is faster than filling up a pack. Wearing a heavy pack can fatigue your back and create saddle sores if you are not adapted to the extra weight. Brian K: Thanks Lynda for both answers. Leslie H: Howdy LW! Thanks for taking our questions. My big 2014 goal is the Tour Divide. I have your Colorado Trail Race Personal Record Plan and Arizona Trail Race 300 Training Plan from previous years. My idea is to stack them back to back for training for the TD. Any advice on stacking two plans of this magnitude? Coach Lynda: Bruce, Congrats on the power meter. You are good to go with the plans you already have! They contain power training guidelines. You do the same 20 min TT to set your HR and power training levels, then follow the power training levels prescribed in each workout in the plan. Re-read your training plans then post back up with any power specific questions. Kevin Mc: Lynda, thank you for doing this! This information is invaluable. I race beginner, but I want to race a few sport classes this year, just for the added length of the race, if nothing else. I’m going to attempt a 100k in May. So far my longest race has only been12 miles. My question is: besides yoga, what other specific exercises should I be doing? Especially in relation to my core and increasing my endurance. Thanks again! Coach Lynda: Kevin, Thx for the nice words. Build up your mileage gradually to your 100k goal in May. You are right that working on core strength is important. It takes a solid core to hold your position on the bike for 100k and cycling does not strengthen your core much (unless you are single-speeding). Look through this doc for core strength recommendations for mountain bikers. Kevin Mc: Thank you very much Lynda, that was just what I was looking for! Jon N: Hey Lynda – Happy New Year. Thanks for the discussion here. I have been following your plans over the years and they are great. I’m having some difficulty planning my training out this year. I’ve been sitting on the fence as to whether or not I want to focus on the longer stuff or the XC distance races. Seems I will do poorly in the shorter races if I’m training for 6 hour and 100K distance races. Do you ever recommend merging two plans together. For example, maybe doing 3 weekly workouts from the SS peak build and race plan and 2 weekly workouts from the 6 hour peak plan?? If so, which workouts would you mix together to get the benefits yet not overtrain? Coach Lynda: When you have a mixed distance schedule and all races are equal in priority the best strategy is to train for the longer events. It is easier to throw in XC races when training long, than it is to go long at race pace when training for XC. That said, when you dilute your goals you dilute your results. I do not recommend mixing the plans up as you ask as this disrupts the plan progression. Mixing plans like this eliminates the designed structure and makes it not really a plan at all.